If you close your eyes and imagine a Manhattan thrift store - this is what you probably come up with. In fact, if you have friends who are snobs about thrift shopping - this is where you must bring them to, to shatter their ideas of thrifting. The Angel Street thrift store (west 17th street and 6th ave) is a treat of a thrift store. It is beautifully organized, has gorgeous window displays and yes - it is expensive. In ways it almost feels like a consignment store because it is dripping with designer clothes - but it is a thrift store all right - where your donations go to benefit people affected by substance abuse, HIV/AIDS and mental illness. What a beauty! And once you actually walk in the shop it is all organized by colour. It has women's clothes, shoes, belts and handbags. 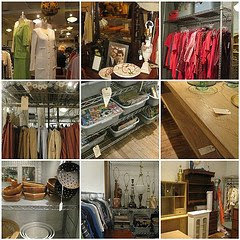 It is pricey but bargains can be found and like many New York thrift stores - it has great sales. When I was there last they had clothes by Vivienne Westwood, Armani, Ralp Lauren, and many other designers, as well as nice clothes by nice people without a flashy name and hefty price tag. The Angel also has a very large furniture selection - which again can be pricey - but always cheaper and much nicer than anything you would buy in a mass market shop. On my trip it had a beautiful solid wood dining table with large heavy benches to go with it. This beauty had just been sold. Besides furniture they also sell housewares, have a whole section of nicely displayed glassware and - in my last trip- had curtain fabric and wallpaper. Men can find a large men's section with shoes and clothes. One man was trying on a rather fetching straw hat when I was there. The Angel also has records and comics, as well as books. Ah! The Angel also has a nice section of lamps - I guess most thrift stores that sell furniture also sell lamps, but The Angel has its own lamp section display. The Angel Street Thrift Shop on west 17th street and 6th avenue sells everything: housewares, women's clothing, jewellery and shoes, men's clothing and shoes, books, furniture, lamps, comics, curtains, wallpaper, etc etc. Opening hours - Mon-Sat: 10 am to 6 pm; Sun; 12pm to 5pm. The Angel offers free pickup for furniture and large donations. 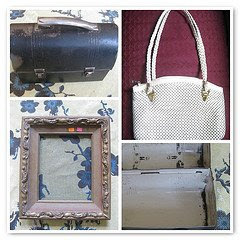 - A quirky handbag - $3. I love it! It has a slightly trashy 80s feel to it - it is covered in a little white metal mesh - and will be great in the summer. Every girl that doesn't take herself too seriously needs an 80s style handbag. - A tin lunch box - $4. Curiously, me and the boyfriend spotted the tin lunchbox of 'junk man' separately. Ooooooh sweet. We are now the proud owners of this lovelieness which we will use to store our assorted house tools. Isn't it perfect? I 'm such a lucky girl. I get to live in New York City AND have a charming flea market two blocks away from me. I can get a flea market fix every Sunday - by walking two blocks to the Greenflea - conveniently located in the Upper West Side on Colombus Avenue and 76th street. It is now part of me and my boyfriend's laundry routine - we drop the clothes at the laundromat and stroll up to the flea market for a quick look. The Greenflea however, is well worth leaving your clothes to wrinkle in the dryer for - give yourself plenty of time to stroll and soak it all in. What I love about the greenflea is its size and variety. The market is located in a school and gets very large in the Summer - with tons of stalls in the school playground- and has an indoors as well as an outdoors part. Near one of the entrances is a large stall with vintage fur coats. Wearing fur is Oh so wrong so I don't tend to hang around there. I walk past the stall that sells only chandelier crystals, all light and sparkle. Opposite the chandelier stall is 'junk man' - with a big bushy moustache and a lovely laid back attitude. He has a table crowded with assorted random things - and if you dig deep - treasures. Oh yes, we've got all manner of things from junk man - and all at super bargain prices. The Greenflea has several furniture stalls: one selling beautiful chunky wood tables, one selling formica 70s style furniture and a recent beautiful vintage furniture stall - among a few others. The prices are not those of thrift stores and reflect more the Upper West Side crowd the market gets - ie expensive. Humph. In the outdoors market you can also find rugs, handmade clothing, loads of jewellery stalls (new and vintage), crafty things like soaps and decorative pieces, photohgraphs, thrift clothes/shoes/handbags, china, antique lighting, and tons of other stuff. The Greenflea is also a farmers market - selling local fruit, veg, flowers, eggs, cheese, honey, juices, pastries, etc. Last week one stall had fresh elederflower cordial! There are also great plants stalls for all you greenfingers - sometimes located two blocks up opposite the Natural History Museum. The indoors market also has lots to see - antique stalls, from stamps to postcards to clothes to everything in between, new designer clothes and collectibles. What are you waiting for? Drop your laundry and get to the greenflea quick! Want to bag yourself a bargain, something vintage, fabulous and random? Hit the New York flea markets. Every Saturday and Sunday you can find the Chelsea Antique & Collectible Flea market in a small space in the corner of 17th street and 7th avenue. The area has other nice things to explore on a lazy Saturday/Sunday. In order to satisfy a thrift craving, I normally pick up my vintage handbag and hit the New York streets. However, when I cannot do that - as a thrift junkie I can get a quick eye candy fix at Housing Works online. Nothing beats rummaging in a thrift shop, but when you cannot do that - the next best thing is online shopping. Housing Works have a good selection online - most of which you can buy immediately. Each of their New York shops has a fantastic window display - and all the items are on auction -which you can check out and bid online. A beautiful vintage silk chiffon green dress, perfect for spring. I love the empire waist and the ruched bust. This beauty is in an auction - ending 26th May. It starts at $35. 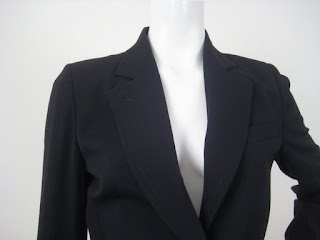 I would pair the dress with this investment piece (read expensive but would wear over and over again) - a Ann Demeulemeester blazer. I love the combination of the feminine floaty dress with a killer tailored blazer. Ann Demeulemeester is a Belgian desginer well known for her perfect cut, edgy monochromatic clothes, which are as beautiful as they are horribly expensive. 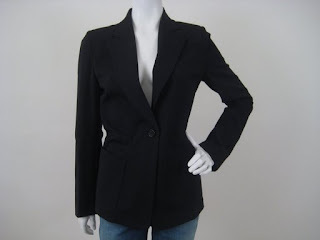 The thrifted blazer is $175, is in perfect condition and is available online right now. Unfortunately it is too large for me but I would love this in my wardrobe - it would look great with anything. The Goodwill is a little treasure trove of goodies. That is, if you are willing to trawl through piles of grizzly coloured nylon shirts, comfortable rubber slip-on shoes (eek!) and scary see-through nighties. Buy hey, I'm not a fair weather thrifter, so I take a deep breath, pull my sleeves up and go for it! This Goodwill is on 79th street between Broadway and Amsterdam avenues. It is small and narrow and you are pushed for space - although that means more thrift, yay! They have a women's clothing and shoes section. I once spied a Cacharel camel creme coat there, but unfortunately it was about 4 sizes too big for me - I bet it made one thrift diva a very happy lady. They also have housewares and books and a men's section. The place isn't for the faint hearted, clothes are tightly packed together, there is usually a barricade of newly dropped bags blocking the narow store and there are no changing rooms - although there is a large mirror. That certainly hasn't stopped me from trying something on although you really don't want to be doing a full monty there. This Sunday I went in and was rewarded with 3 classic books for ....drum roll...a grand total of $2,30. The books are used and have that nice soft feel to them. I've already started on to Kill a Mockingbird. And by reading my all time classics I'm contributing to the greater good. Your dollars contribute to training, education and career services for the disadvantaged. Nice stuff. The 79th Street Goodwill sells housewares; women's clothing and shoes; men's clothing and shoes; and books. Opening hours - conveniently open late: 10 am to 8 pm every day except on Sundays where it closes at 7pm. When we walk into Housing Works Upper West Side store, me and The Boy have developed a little routine. At the front of the store is an arrangement of furniture that we walk around together, imagining where we would put the table or the desk in our imaginary house (our little Manhattan shoebox apartment cannot take anymore thrifty finds!). I then make a beeline for the shoes and clothes whilst The Boy heads for the books and CDs. This routine works beacuse I know exactly where to find him when I need to ask him abpout 5 times whether he really loves the fab shoes that I've just tried on. My neighbourhood thrift store, the Housing Works Upper West Side store, located on Columbus Avenue between 74th and 75th street, is a little piece of New York thrifty heaven located one block from where I live. The store is part of the Housing Works chain, which has seven thrift stores, located in upscale Manhattan neighborhoods, dahling. Each store has a fantastic window display, offers great selections and is well organized. The Housing Works stores are the best kind of thrift stores - where you can buy a great pair of shoes or the perfect table for that spot in your living room - whilst getting yourself some good karma as your money helps provide services for homeless and low-income New Yorkers living with HIV and AIDS. The store's clothing can often be expensive - compared to other thrift stores - and the selection can sometimes be a little staid - unless of course you are a 70 year old lady that lunches. There are however treasures to be found and you should always watch out for the sales - they often have them for different store items - when I went two weekends ago the whole store had 40% off and recently they had shoes 30% off. The furniture selection is excellent -they have an eclectic mixture of functional and quirky pieces. Take for instance the rustic wood table or the modernist lamp I spotted there recently . The housewares are good and I have bought many a china plate there. The book selection is very good, with a mixture of genres and of hardbacks/paperbacks. For their spring clearance all books were 10 cents. The shoe selection is my perdition. I simply cannot resist it, I have bought....err I rather not count....many a pair there. The condition and the prices tends to be very good. Here are the beauties I bought yesterday ($12), I need to figure out what to wear them with. The store tends to get very crowded on Sundays, I'd recommend you go during the week or on a Saturday. The Upper West Side Housing works sells furniture; housewares; women's clothing and shoes; men's clothing and shoes; books and CDs; and jewellery. Opening hours: 11-7 Mon to Fri. 10-6 Sat. 12-5 Sun.